Newsletter 176: "I insisted on doing things the best way..."
This scale model reference is based on the late season Formula 1, featuring a big rear diffuser and major aerodynamic modifications in the bodywork. Inside the gorgeous red box by MFH you'll find milled and turned aluminium parts, photoetches, top quality decals, white metal parts, resin parts, rubber tyres printed with Good Year logos, and many many more parts, each one more amazing than the other. This scale model kit is based in the mid season version, featuring a relocation of the radiator (horizontally placed) and the modification of the side pontoons. Inside the box, you'll find milled and turned aluminium parts, photoetches, top quality decals, white metal parts, resin parts, rubber tyres printed with Good Year logos, and many many more parts, each one more amazing than the other. 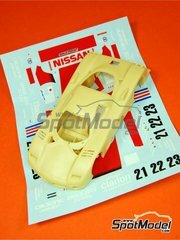 This kit is based in the early season version, featuring a big rear spoiler and sharp lines in the bodywork . 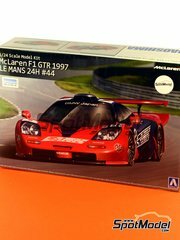 Inside the box, you'll find milled and turned aluminium parts, photoetches, top quality decals, white metal parts, resin parts, rubber tyres printed with Good Year logos, and many many more parts, each one more amazing than the other. The eighties left us with some fabulous Ferraris with flat 12 cylinder engines and legendary air intakes in the bodywork, now reproduced in this scale kit by Fujimi. The parts break up is well structured and extensive, the bodywork is made in one piece, tyres are rubber made, includes chromed parts.... and the air intakes are gorgeous!! 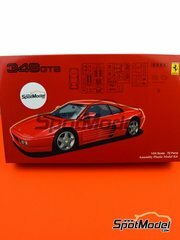 Passion red is the car, passion red is the box, and passion is the only thing what will guide you building this kit from start to end, thanks to their easiness. 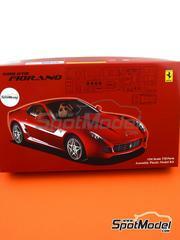 The bodywork is injected in just one piece, rims are chromed, tyres are rubber made, and the decals are just perfect. 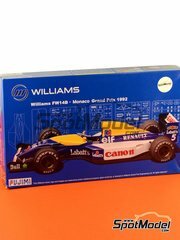 Williams Team made spectacular innovations in Formula 1 during the 90s with their technological advances, and Fujimi has done just the same with the plastic injection of this kit. Just have a look at the rear spoiler, executed in just one piece: simply spectacular. The kit does NOT include decals for the tobacco logos. 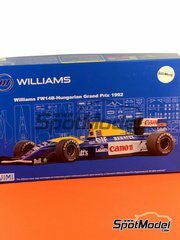 During the 90s, Williams made spectacular innovations in Formula 1 with their technological advances, and Fujimi has done just the same with the plastic injection of this kit. 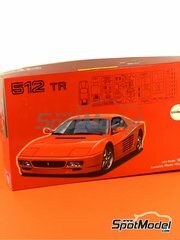 Just look at the rear spoiler of this kit, made in just one piece: simply spectacular. As usual, this kit does NOT include any tobacco logos decals. 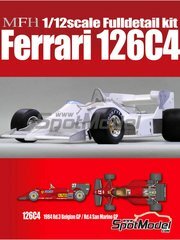 Ferrari doesn't stop making beautiful cars, and luckily Fujimi reproduces every one for us to build them... Isn't it just great? 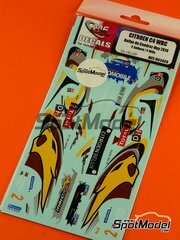 The kit features an extensive and well laid part listing as usual with Fujimi, the bodywork is made in just one piece, tyres are rubber made, and it also includes chromed parts. 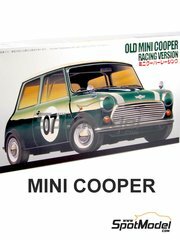 A classic english car still alive and kicking (REALLY kicking) at the classic races, the Mini Cooper Mk I. Fujimi gives us this version with anti-roll bars, racing decoration, right-handed sport steering wheel, bucket seats, and two dashboards for both the old (center console speedo) and new (wheel mounted speedo) versions of the car. That's Mr. Bean dream!! 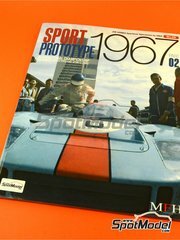 A new issue of the Sportcar Spectacles - Sport Prototypes series featuring Joe Honda pictures, this time at the Monza 1000 Kms, Spa 1000 Kms, Nürburgring 1000 Kms and BOAC 500 Kms races. The main focused vehicles are: Ferrari 330P4/410P, Porsche 910 and 906, Lola T70 Mk III, in addition to Aston Martin, Chevrolet, Chaparral 2F, Mirage M1, Mini Marcos, and others. All of it in 108 full colour A4+ oversized pages (297mm x 232mm), including a grand total of 600 pictures. Volume texts are written in Japanese, with partial English translations. Isn't it wonderful that a 1/43 scale kit have more parts than most bigger scale kits? Have you ever used premoulded photoetches for the rims? Can you face that challenge?